TOM TOM CLUB: TOM TOM CLUB: 1981: 4 STARS OUT OF 5 STARS: Talking Heads Chris Frantz and Tina Weymouth’s side band. Genius Of Love is one of my favorite songs of the 80’s. Genius Of Love and Wordy Rappinghood both topped the dance charts. A fun album. IRON CITY HOUSEROCKERS: LOVE SO TOUGH: 1979: 4 STARS OUT OF 5 STARS: Led by Joe Grushecky- a friend of The Boss’s. Pittsburgh band from 1976-1984 broke up when the record company dropped them for lack of record sales. I especially enjoy their first two albums- this was their debut. Grushecky is still out there recording and doing concerts. For every Bob Seger who after years broke out from his Detroit area success to national success there are always the Grushecky’s who for whatever reason remain big only in their region. The Houserockers deserved more success. File under rock and roll. Favorites- Hideaway, Love So Tough, Veronica, Turn It Up and Heroes Are Hard To Find. . I think their second album is even better. 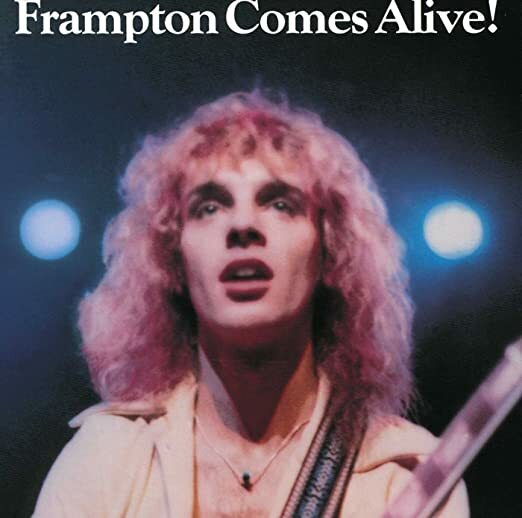 PETER FRAMPTON: FRAMPTON COMES ALIVE! : 1976: 4 STARS OUT OF 5 STARS: How many performers are remembered first and foremost- for a live album? I can only think of one- Peter Frampton. This double live album which produced three hit singles- Baby, I Love Your Way #12, Do You Feel Like We Do #10 and Show Me The Way #6 [the album itself went #1} was all over the place in the mid 70’s. Very odd, he wasn’t a big name star before releasing this album. None of his solo albums had even charted. Then BOOM! Then he made some bad career choices- I’m In You- one of the most laughed at songs of the decade- and trying for the pin-up boy image- which hurt his street cred. Then of course his role in the Sgt.Pepper movie/soundtrack fiasco. I think the bottom line is- he just couldn’t supply the songs. He is a fine musician but not a great songwriter. Frampton Comes Alive! a souvenir postcard from the mid-70’s. SMOKY ROBINSON AND THE MIRACLES: GOING TO A GO-GO: 1965: 4 STARS OUT OF 5 STARS: Motown in the 60’s was famous for their great singles not for their albums. This album is pretty good but top heavy. Great songs on side 1- 4 Top 20 hits- Ooh Baby Baby, The Tracks Of My Tears, Going To A Go-Go, and My Girl Has Gone- and other Choosy Beggar which was an R&B hit and I am surprised it wasn’t a hit single on the pop charts. Side 2 not so great- filler except for From Head To Toe. BOB WELCH: THREE HEARTS: 1979: 3 STARS: The follow up to Welch’s platinum French Kiss album – it has his final hit- Precious Love #19- a cover of The Beatles “I Saw Her Standing There”- Here Comes The Night, Church other favorites from this- a decent pop album- not quite up to French Kiss. 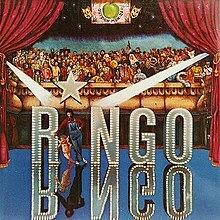 RINGO STARR: RINGO: 1973: 4 1/2 STARS OUT OF 5 STARS: Ringo’s best and most successful album. Photograph, You’re Sixteen, Oh My My were hits. The album is also noted for some of his friends who helped him out on the album- three guys named John, Paul and George all made contributions. John Lennon wrote one of the best songs on the album for Ringo- I’m The Greatest. Also appearing- Billy Preston, Klaus Voormann, Nicky Hopkins, Jim Keltner, Jack Nitzche, Levon Helm, Robbie Robertson, Rick Danko, Garth Hudson, David Bromberg, Nilsson, Martha Reeves. LINDA RONSTADT: MAD LOVE: 1980: 3 STARS OUT OF 5 STARS: Ronstadt’s attempt at a new wave sound. She covers three Elvis Costello songs, a Neil Young song. The album had three hits- How Do I Make You, Hurts So Bad and I Can’t Let Go. A listenable album but the style didn’t fit her. THE PRETENDERS: THE PRETENDERS II: 1981: 4 STARS OUT OF 5 STARS: Message of Love and Talk Of The Town are first rank- and two of my favorite ever Pretenders songs- the rest of the album is kind of hit and miss- not up to par with the spectacular debut but few albums really are. They do another cover of a Ray Davies- Kinks song- I Go To Sleep. I saw them on the tour for this album. One of my favorite bands of the early 80’s. VAN MORRISON: INTO THE MUSIC: 1979: 5 STARS OUT OF 5 STARS: One of my favorite Van albums- an album I never get tired of hearing. Van covers It’s All In The Game- the author of the music which was written in 1911- is Charles Dawes- who would go on to become Vice President under President Calvin Coolidge. It is the only #1 hit co-written by a Vice President or Nobel Peace Prize winner- Dawes was both. Charles Dawes father Rufus Dawes was a noted member of the famous Iron Brigade and was one of the heroes at the Battle of Gettysburg. Rufus Dawes was the great- grandson of William Dawes who alerted the minutemen that the British were on the way- prior to the Battles of Lexington and Concord. KATRINA AND THE WAVES: KATRINA AND THE WAVES: 1985: Featuring Walking On Sunshine which went to #9 on the Billboard charts. The most noted songs on the album- Walking On Sunshine and Going Down To Liverpool [later covered by The Bangles} were rerecorded versions from songs that were on their first independent album released a few years earlier. This isn’t just an album with a hit and filler- it is a pretty strong pop album- in addition to the songs already mentioned- favorites- Do You Want Crying, Que Te Quiero and The Sun Won’t Shine . 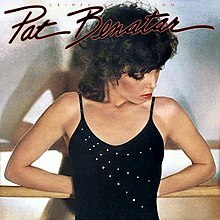 PAT BENATAR: CRIMES OF PASSION: 1980: 4 STARS OUT OF 5 STARS: Benatar’s second album- and the only one in my collection. The first single failed to crack the top 40- You Better Run #42, the second single “Hit Me With Your Best Shot” #9 and then Treat Me Right #18. The song Hell Is For Children wasn’t released as a single but got a lot of play back then on AOR stations. in the 20 days since I’ve gone back to vinyl- I have listened to 127 albums. I’d forgotten about The Pretenders’ version of ‘I Go to Sleep’. I love that one. They should have kept up that one Kinks cover an album tradition. I liked Stop Your Sobbing from the debut too. Me too. That’s a favorite of mine. It is strange. I’m not sure if I’d appreciate the album more if the tracks–the good ones–were more evenly distributed. It’s not that the other tracks are bad, it’s just a drop off in quality. On second thought, I think it would be better to mix them up. The first side was so strong… I wonder how much thought was put into the order of the songs? On U2’s Joshua Tree- they had the songs and gave them to the wife of one of their assistants- to put them in what order- she put them in order from her favorite to least favorite-so U2 put very little thought on that albums order- and I can’t think of an album that’s first three songs are as strong as The Joshua Tree–but it does get a little weak on the second half of the second side…. I remember the Frampton Comes Alive album was playing everywhere I went the summer it came out. Good review of Frampton in light of the music.